Linear motors are easy to install and integrate. Position and force are fully programmable and there is no backlash or fluid compressibility to compromise position accuracy. The linear motor's high velocity enables manufacturers to increase throughput. At the same time, its high accuracy and consistent repeatability contribute greatly to improved product quality. These linear motors are ideal for OEM machine builders and factory automation applications, for example: material testing, packaging / forming, end-of-line test systems, process automation, stamping, and semi-conductor manufacturing systems. Want to learn more about the applications and uses of linear motors? 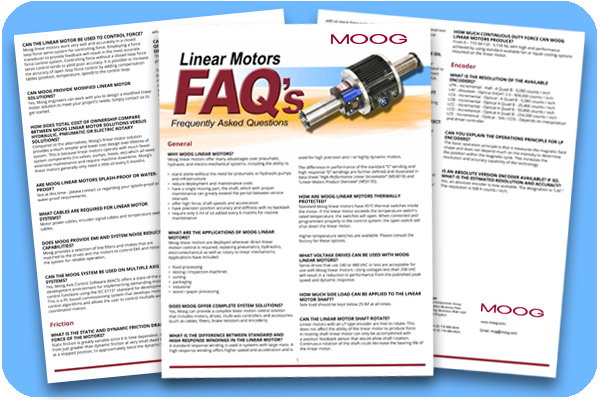 Download our linear motor FAQs by submitting the form to the right.